Jan and Cora Gordon made two visits to Spain, in 1920 and 1921. I retraced much of the second journey in the summer of 2009. "The posada is probably the most characteristic monument of old Spain still in existence, being perhaps less modified by the influence of modernity than its rival in village importance, the church. There are posada in "Don Quixote" which might have been described from buildings in use to-day, and as the posada of Lorca was one of the most characteristic we were ever lodged in, it merits a short description." 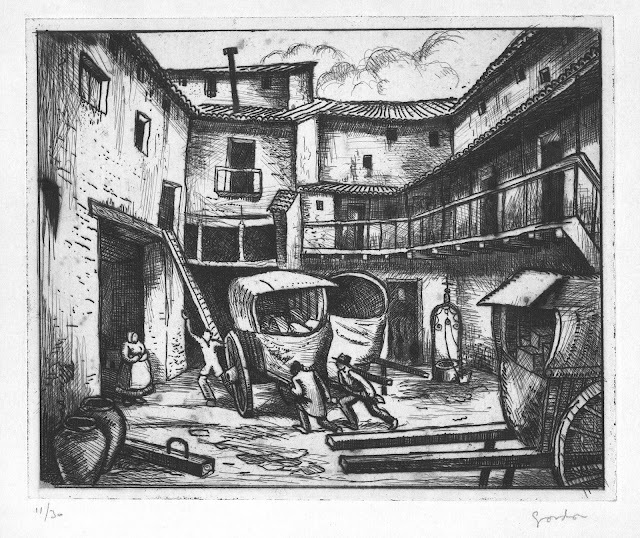 The description begins with the courtyard, which is well illustrated in the etching shown below.